To promote consistency in patient care service delivery across the profession, national pharmacy associations working under the direction of the Joint Commission of Pharmacy Practitioners (JCPP), used a consensus-based approach to articulate the patient care process for pharmacists to use as a framework for delivering patient care in any practice setting. The Pharmacists’ Patient Care Process is intended to be used for a wide array of patient care services as authorized under pharmacists’ scope of practice and delivered in collaboration with other members of the health care team. 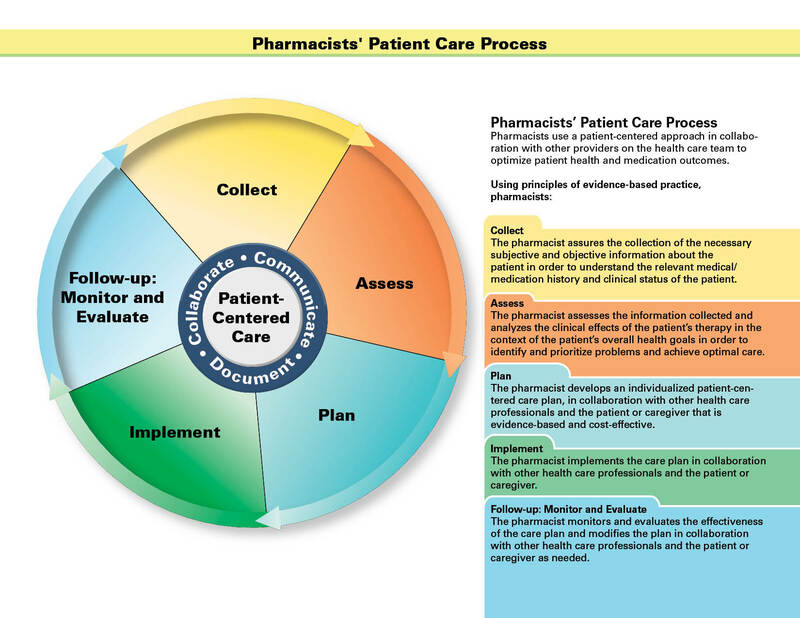 View the Pharmacists’ Patient Care Process diagram. Based on an environmental scan of pharmacists who deliver patient care services, the Digest reports on evolving trends, successes, and barriers for the profession in transforming pharmacists’ roles to better meet patients’ needs through team-based care. This model, a joint initiative between APhA and NACDS, is crafted to maximize effectiveness and efficiency of MTM service delivery across pharmacy practice settings in an effort to improve continuity of care and patient outcomes. The Administrative Simplification provisions of the Health Insurance Portability and Accountability Act of 1996 (HIPAA) mandated the adoption of standard unique identifiers for health care providers and health plans. The purpose of these provisions is to improve the efficiency and effectiveness of the electronic transmission of health information. The process described is applicable to community pharmacies and consultant pharmacists who provide MTM services from non-pharmacy settings. APhA’s Billing for MTM Services – Tips for Pharmacists will assist you with setting up and maintaining a successful MTM business. Strategies for incorporating superbills into pharmacy practice are described in the current work, and a model superbill is provided. This monograph addresses issues that are specific to providing MTM services in an independent practice. Learn strategies for starting your independent practice, identify laws and regulations that you must comply with as an MTM provider, and analyze potential challenges so you can be prepared and develop a well thought out plan before providing MTM services to patients. Learn the three MTMS CPT codes and how to use them. The Health Insurance Portability and Account ability Act of 1996 (HIPAA) included a provision requiring the adoption of a standard unique health identifier for each individual, employer, health plan, and health care provider for use in the health care system. On January 23, 2004, the Centers for Medicare & Medicaid Services (CMS) released the final regulation to implement the unique health care identifier for health care providers. Patient Self-Management Program for Diabetes was the APhA Foundation's first demonstration project for diabetes, designed to establish a new health care delivery program at five pilot sites over the span of a year. ​Following of the success of the Asheville Project and other collaborative care programs involving pharmacists, the APhA Foundation rose to the challenge of developing a model that could be replicated and scaled up in diverse community and payer settings. With the support of a grant by Aventis Pharmaceuticals, PSMP for Diabetes was implemented with new components that focused on aligned incentives, collaborative care and a Patient Self-Management Program for Diabetes credentialing process. Know the basics on billing for MTM services. Improving care for your patients by optimizing medication use. Learn how to create a SWOT (strengths, weaknesses, opportunities, threats) Analysis for an MTM Practice. This article describes how to use relationship marketing to create and maintain a network of productive relationships with selected groups of patients and other partners to expand the delivery of patient care services. This article provides an overview of the key steps in writing a business plan, with an emphasis on planning for pharmacy-based services. Learn about the four essential components of asthma care, namely: assessment and monitoring, patient education, control of factors contributing to asthma severity, and pharmacologic treatment. This publication for health professionals summarizes recommendations derived from the evidence-based full clinical guidelines. Key tables and figures from the full report are included for easy reference. This complete version of the updated guidelines for hypertension is written for the health care professional who wants to understand the science behind the new recommendations on high blood pressure. The JNC 7 Complete Report focuses on the new evidence, including a revised treatment algorithm, drug tables, and more. The intent of this joint publication between American Pharmacists Association (APhA) and the American Society of Health-System Pharmacists (ASHP) is to provide a better understanding of the medication reconciliation process, its effect on patient care and outcomes, and how pharmacists can contribute to improving this process using a standardized framework of service delivery defined in the context of medication therapy management (MTM). In 2006, HHS initiated the Personalized Health Care Initiative with the goal of building the foundation for the delivery of gene-based care, which may prove to be more effective for large patient subpopulations. In the years since the initiative was launched, drug manufacturers and FDA have begun to incorporate pharmacogenomic data and applications of this information into the drug development, labeling, and approval processes. New applications and processes for using this emerging pharmacogenomics data are needed to effectively integrate this information into clinical practice. Building from the findings of a stakeholder workshop convened by APhA and the advancement of the pharmacist’s collaborative role in patient care through MTM, emerging roles for pharmacists using pharmacogenomic information to improve patient care are taking hold. Realizing the potential role of the pharmacist in pharmacogenomics through MTM will require connectivity of pharmacists into the electronic health record infrastructure to permit the exchange of pertinent health information among all members of a patient’s health care team. Addressing current barriers, concerns, and system limitations and developing an effective infrastructure will be necessary for pharmacogenomics to achieve its true potential. National Guideline Clearinghouse (NGC) is a public resource for evidence-based clinical practice guidelines. Patient Self-Management Credential (PSMS) The Patient Self-Management Credential (PSMC) is a psychometrically validated tool developed by the APhA Foundation that empowers health care providers (HCPs) and patients to work together in meaningful and efficient ways to identify and address areas for improvement in the self-management of chronic diseases. Patient credentialing is a unique concept where patients’ knowledge of their disease, lifestyle requirements, and therapy adherence strategies are assessed so HCPs can tailor self-management education to the topics that are unfamiliar to the individual patient. Patients are also assessed on the skill set needed to effectively manage their chronic disease and how well they consistently perform those skills and work toward ongoing self-management. This report summarizes the submissions from 18 colleges and schools of pharmacy on successful practices to incorporate medication therapy management (MTM) into the curriculum. This five to six week Advanced Pharmacy Practice Experience (APPE) in Ambulatory Care rotation provides the student pharmacist with broad-based exposure to medication therapy management patient care activities in the ambulatory care practice environment. The medication therapy management Advanced Pharmacy Practice Experience (APPE) in Community Pharmacy Practice provides the student pharmacist with broad-based exposure to medication therapy management patient care activities in the community pharmacy setting. Academicians can help pharmacists in developing, implementing and evalulating MTM services. This guide provides a summary of many resources related to CCM requirements and services. Review the recommended points to discuss during a medication consultation to keep your patients educated. Establishing, expanding, and maintaining a medication therapy management (MTM) service depend on patient interest and demand for service, which ultimately stem from patients’ personal experiences in the pharmacy and with the pharmacist. This resource, developed by the APhA Medication Management Special Interest Group, provides valuable tips for engaging patients in MTM services. It includes sample scripts for scheduling appointments and answers to patients' frequently asked questions. APhA, NACDS and NCPA joined together for Project Destiny, which has identified potential mechanisms for offering services to patients that are valued by the healthcare system which can be replicable, scalable and economically viable for community pharmacy. Incorporating MTM into your practice requires a shift in focus from the role of provider and educator of appropriate and safe medication use for individual prescriptions to a role that includes evaluation of the patient’s entire medication regimen and collaboration with the patient’s health care team. Learn helpful tips for planning ahead to ensure a more efficient and successful MTM practice. Identify specific measurable outcomes to gauge the success of your MTM practice. This webinar and resource, developed by the APhA Medication Management Special Interest Group, provide valuable tips utilizing pharmacy technicians to enhance MTM services. >>> View the PDF slides. >>> View the Team document. How prepared are are you to provide medication therapy management (MTM) services to the patients in your pharmacy practice setting? Please Take this quick 10-minute self-assessment survey to gauge how ready you are to deliver MTM! MTM encompasses a broad range of professional activities and responsibilities within the licensed pharmacist’s, or other qualified health care provider's, scope of practice. PSTAC was founded in 2002 to improve the coding infrastructure necessary to support billing for pharmacists' professional services. The Coalition works to provide the national leadership necessary to position and secure pharmacy's place in the electronic data interchange (EDI) health encounter/claims processing and payment environment concerning all health care providers' professional services. Improving care for your plan participants and reducing costs by optimizing medication use. Pharmacists improving care for patients by optimizing medication use. The purpose of this document is to help guide designers of MTM programs to identify the critical elements that support an effective, quality MTM program and allow them to be constructive in encouraging positive patient outcomes. Learn techniques to improve medication adherence within your practice. MEDMARX facilitates the collection and analysis of medication errors occurring in hospitals and related health systems. The MTM Digest tracks implementation of MTM across the country, highlighting survey responses from MTM payers and providers and discussing key developments in the marketplace. This compendium of pharmacist provision‐of‐care publications was created by a group of scientific experts charged them with identifying examples of the best evidence of pharmacists’ impact on patient medication–related and other health outcomes. APhA Academy of Pharmaceutical Research and Science (APhA-APRS) stimulates the discovery, dissemination and application of research to improve patient health and serves pharmacists and those members who are involved in the pharmaceutical sciences. The APhA Foundation is involved in a number of research projects that establish new models of practice for pharmacists and redefine patient care in pharmacy practice. Conducted by the APhA Foundation with support from GlaxoSmithKline, the Diabetes Ten City Challenge established a voluntary employee health benefit, provided incentives through waived co-pays for diabetes medications and supplies, and helped people manage their diabetes with help from a pharmacist "coach" in collaboration with physicians and diabetes educators from 2005-2009. The Journal of Pharmaceutical Sciences will publish original research papers, original research notes, invited topical reviews (including Minireviews), and editorial commentary and news. The area of focus shall be concepts in basic pharmaceutical science. The Journal of the American Pharmacists Association (ISSN 1544-3191 [print] and 1544-3450 [online]) is the official peer-reviewed journal of the American Pharmacists Association (APhA), providing information on pharmaceutical care, drug therapy, diseases and other health issues, trends in pharmacy practice and therapeutics, informed opinion, and original research.